Loki (pronounced “LOAK-ee;” Old Norse Loki . . .) is the wily trickster god of Norse mythology. Loki is difficult to describe. He isn’t one of the Aesir, but he gets lumped with them because of his association with Odin, especially in the tales where Odin, Hoenir, and Loki travel together. At least one of his parents was a giant, his father Farbauti. Not much is known about his mother, except her name, Laufey or Nal. 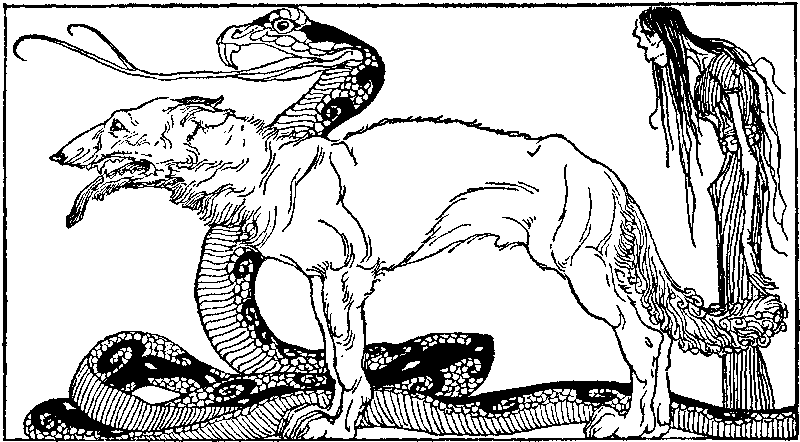 Loki is the father of Fenrir, Jormungand, and Hel, by the giant, Angrboda. Loki, with his wife Sigyn, had one other child, Narfi or Nari. And most mysteriously, Loki is the mother of Odin’s eight legged horse, Sleipnir, as a result of his shape-shifting into the form of a mare in order to lure the stallion Svadilfari away from his master’s task. Svadilfari’s master was a giant who had challenged the gods that he could complete building a protective wall around Asgard within one winter. The giant’s price for accomplishing the task: the hand of Freya as well as the sun and the moon. The unnamed giant builder had originally proposed he could build the wall, with only the help of his stallion, in three seasons. Loki suggested to the gods that they accept the giant’s proposal but to insist the work be done in only one winter. The builder accepted. Because the builder made progress so much more quickly than the gods had expected, they seized Loki and threatened to kill him if he could not come up with a solution to stop the progress so they would not have to give up Freya, the sun, and the moon. Loki’s shape-shifting solved the problem. The builder could not complete the wall without the assistance of his stallion. Freya, the sun, and the moon were not lost. When the giant insisted he receive fair payment for the work he had done, the gods gave him what they considered he deserved, a fatal blow on his skull that broke the bones into pieces no larger than breadcrumbs. Any tale involving Loki seems to involve ambiguity in its lessons. Did the giant deserve death for not completing the work within one season instead of three seasons? Did the gods act fairly when they insisted Loki take action to prevent the giant from completing the task? Did Loki act on the gods’ behalf when he suggested changing the terms of the task from three seasons to one winter? Was the giant’s intention–to plunge the whole cosmos into darkness by removing the sun and moon–so abominable that taking any action, including trickery, was appropriate to prevent it? Those questions and others like them follow Loki in every tale that includes him. He is the reminder that the world is not black and white. That answers are not either true or false, good or bad. That reality includes a bit of all opposites, and living requires recognizing ambiguity exists everywhere. No one can escape it. Idun (pronounced “EE-done;” from Old Norse Iðunn, “The Rejuvenating One”) is a goddess who belongs to the Aesir tribe of deities. Her role in the pre-Christian mythology and religion of the Norse and other Germanic peoples is unfortunately obscure, but she features prominently in one of the best-known mythological tales, The Kidnapping of Idun. In this tale, which comes to us from the skaldic poem Haustlöng and the Prose Edda, Idun is depicted as the owner and dispenser of a fruit that imparts immortality. In modern books on Norse mythology, these fruits are almost invariably considered to be apples, but this wasn’t necessarily the case in heathen times. The Old Norse word for “apple,” epli, was often used to denote any fruit or nut, and “apples” in the modern English sense didn’t arrive in Scandinavia until late in the Middle Ages. Whatever species Idun’s produce belongs to, its ability to sustain the immortality of the gods and goddesses makes Idun an indispensable presence in Asgard. Idun, the Aesir goddess of youth, possessed fruit, most often referred to as apples, that delayed aging in those who ate it. She was an important goddess to keep around. But one day she disappeared. This story is an early one since Hoenir is still with the Aesir, before he was one of the Aesir hostages sent to the Vanir at the conclusion of the first Aesir-Vanir war. The story begins when Loki, Odin, and Hoenir (see F is for Freyja for an earlier mention of Hoenir) traveled through a mountainous region where little food could be found. When they came upon a herd of oxen, they killed one and began to cook it over a fire, but it never cooked. When the three discussed how it could be that an ox over a fire wouldn’t cook, they heard a noise above. An eagle in the branches of a tree above them explained that he had cast a spell on the fire so that it would not cook the meat. The eagle offered to release the spell in return for first having his fill of the meat. The gods weren’t pleased, but agreed, and the eagle took the choicest pieces of the ox. Loki wasn’t happy with the loss of the best pieces, so he grabbed a heavy branch and struck the eagle, who was in reality the giant, Thjazi. The branch stuck to Thjazi, who, with Loki still hanging on, flew high into the sky. Loki begged Thjazi to return him to earth. 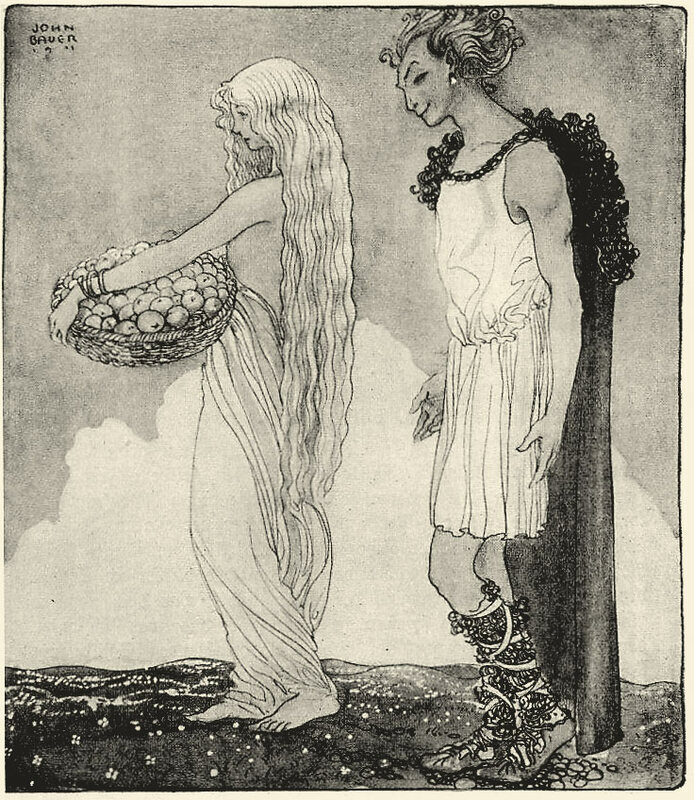 Thjazi agreed on the condition that Loki would bring him Idun and her fruit. Loki agreed but didn’t tell the other gods. When the three returned to Asgard, Loki went to Idun and told her that they had found fruits on their journey that were far superior to hers. He offered to take her to the place and convinced her to bring her fruits with her to compare. Idun followed Loki, and when they reached the place, Thjazi arrived, again in the guise of an eagle, and took Idun away to his palace in Jotunheim. Back in Asgard, the gods began to notice they were showing signs of age: sagging skin, greying hair. When they realized Idun was no longer in Asgard and had last been seen with Loki, they forced Loki to tell them what had happened. The gods insisted Loki do something to return Idun to Asgard. Freya loaned Loki her hawk feather cloak which allowed Loki to change into the form of a hawk and fly to Jotunheim. When he reached Thjazi’s home, he discovered Thjazi was away. Delighted with his good luck, Loki transformed Idun and her fruit into a nut which he grabbed in his talons and headed back to Asgard. When Thjazi returned and found Idun gone, he turned himself again into an eagle and began chasing Loki. As Loki approached Asgard, the gods built a pile of kindling around their fortress. Thjazi was so close behind Loki that once Loki had reached the fortress with Idun, the gods set the kindling afire, and Thjazi was unable to avoid flying into the burst of flames. His feathers caught on fire, he fell, and the gods killed him. Loki isn’t such a bad guy in this story. He is just one of the guys, suffering the same troubles as the others, and trying to come to the defense of all three by attacking Thjazi in his eagle shape. But then he gets stuck and must turn to the enemy for help. Can anyone blame him for agreeing to Thjazi’s terms for his return to safety? How might the story have changed if Loki trusted Odin and the other gods with his dilemma? Loki’s problem is that he always wants to do things alone, his way. If he needs help from others, he turns to trickery and guile, not honesty and trust. But every story needs conflict, a villain to fight against. Giants aren’t enough in these tales. Loki, the betrayer, plays for and against both the good guys and the bad guys. His presence forces the others to show their true colors. What can I learn from the story of the kidnapping of Idun? Maybe I need to figure out how to incorporate a Loki figure in the stories I write. Reference to Idun and her apples can be found in the Poetic Edda, stanza 44, Grimnismol, The Ballad of Grimnir; stanzas 19-20 of Skirnismol, The Ballad of Skirnir; stanzas 19, Harbarthsljoth, The Poem of Harbarth; stanzas 16-18, Lokasenna, Loki’s Wrangling; stanza 3, Thrymskvitha, The Lay of Thrym. Simek, Rudolf. 1993. Dictionary of Northern Mythology. Translated by Angela Hall. p. 171. Turville-Petre, E.O.G. 1964. Myth and Religion of the North: The Religion of Ancient Scandinavia. p. 186. Fenrir (pronounced “FEN-reer;” Old Norse Fenrir, “He Who Dwells in the Marshes”) is the most infamous of the many wolves in Norse mythology. His importance for the pre-Christian Scandinavians is demonstrated by his being depicted on numerous surviving runestones, not to mention his ubiquity in Old Norse literary sources. He’s the son of the god Loki and the giantess Angrboða, which makes him the brother of the serpent Jormungand and the underworld goddess Hel. Fenrir, the wolf, contrasts with a number of other named wolves in Norse mythology. For instances, the wolves Geri and Freki (Old Norse, both meaning “the ravenous” or “greedy one”) accompany Odin and are often depicted at the side of his throne, as his protectors. Fenrir, on the other hand, is no friend to Odin. Neither were Loki’s other two children. The gods tried to banish Loki’s children in an attempt to escape the foreboding destiny they feared from them. They threw the Jormungand serpent into the sea where he then encircled Midgard, the land of humans. They relegated Hel to the underworld, also called Hel, one of several final destination for the dead. Perhaps they hoped she would be satisfied ruling over that portion of the Norse cosmos. But Fenrir was scary. They decided they needed to keep him close, in Asgard. Fenrir grew quickly and soon became so large the gods feared he would destroy wherever he was kept. Binding him and locking him away seemed the only answer. The gods used trickery and Fenrir’s vanity by telling Fenrir they wanted to challenge his strength by wrapping him in chains which he then would break free from. Over and over, they wrapped Fenrir with ever stronger chains, and each time Fenrir broke loose. Eventually, the gods turned to the dwarves, the master craftsmen of the cosmos, and asked them to create a binding so strong that Fenrir couldn’t break free. The dwarves used ingredients that do not exist, such as the sound of a cat’s footsteps, the beard of a woman, the roots of mountains, the breath of a fish, and the spittle of a bird, to create a ribbon they named Gleipnir. Since the materials used in the binding do not exist, there was no point in resisting it. When Fenrir saw the lightweight ribbon, he became suspicious and only agreed to be bound with it if one of the gods would place his hand in Fenrir’s mouth while the gods bound him. Only one god, Tyr, was brave enough, though he knew he would lose his arm when Fenrir realized he couldn’t break free. Once Fenrir was bound, the gods moved him to an isolated spot and held Gleipnir down with a large boulder. They also forced Fenrir’s mouth open with a sword to keep his jaws open. And that should have been that. But this is mythology. More dramatic events must follow. Watch for R is for Ragnarök later this month. The full story of the binding of Fenrir can be found in Norse Mythology for Smart People. Tales of Fenrir are mentioned in the Poetic Edda, stanzas 40, 44, 47, and 51-53 of Voluspo, The Wise Woman’s Prophecy. Geri and Freki are mentioned in the Poetic Edda, stanza 19, of Grimnismol, the Ballad of Grimnir. Simek, Rudolf. 1993. Dictionary of Northern Mythology. Translated by Angela Hall. p. 81. Sindri then set another piece of gold on the fire as Brokkr worked the bellows. The fly bit Brokkr on the neck, and Sindri drew out a magnificent ring, Draupnir (“Dripper”). From this ring, every ninth night, fall eight new golden rings of equal weight. Draupnir, one of six magnificent gifts, is part of the story of how Thor got his hammer. And there’s plenty of deception involved. Once again, a key player is Loki, the mischievous trickster. He is never satisfied with what he has, always on the lookout for more. Loki cuts the hair of the goddess Sif. One day he cut off the golden hair of Sif, Thor’s wife. Thor was not pleased and threatened Loki with breaking all his bones. But Loki pleaded for his life, promising that he could get the dwarves, master craftsmen, to replace Sif’s hair. Thor agreed, and Loki headed for Svartálfaheimr, the home of the Black Elves. Loki was able to convince the sons of the dwarf, Ivaldi, to create a more beautiful head of hair for Sif than she had had before. But that’s not all they did. They also created two more gifts, Skidbladnir, a ship that could be folded up and put into a pocket, and Gungnir, the mightiest of swords. “The third gift — an enormous hammer” by Elmer Boyd Smith. 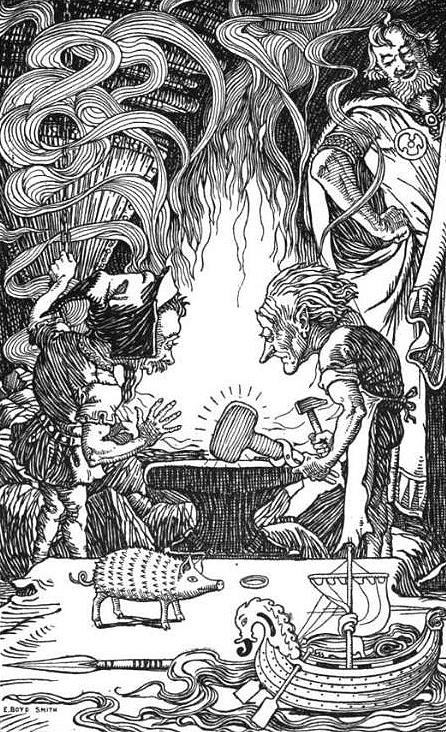 The dwarven Sons of Ivaldi forge the hammer Mjolnir for the god Thor while Loki watches on. On the table before them sits their other creations: the multiplying ring Draupnir, the boar Gullinbursti, the ship Skíðblaðnir, the spear Gungnir, and golden hair for the goddess Sif. You’d think Loki would be pleased that he would return from Svartalfaheimr with more than he promised, but then that just wouldn’t be like Loki. Instead of returning with the replacement hair for Sif, the ship that always found favorable winds, and the mightiest of swords, he thought he’d like to remain with the dwarves, out of Thor’s sight, and able to cause more mischief. He came up with a bet for two dwarf brothers, Brokkr and Sindri, a challenge that they could not match the craftsmanship of Ivaldi’s sons by coming up with three more magnificent items. If they failed, Loki said they could have his head. Brokkr and Sindri accepted the challenge. In his attempt to foil the two, Loki, a shape shifter, transformed himself into a fly and bit each of the dwarves as they worked to create Gullinbursti, a living boar with golden hair, who gave off light in the dark and could run better than any horse, even through water or air, and Draupnir, the magnificent ring. Since his first efforts to foil the dwarves with his fly bites had failed, this third time, as Sindri set out to create a hammer for Thor, Loki bit him on the eyelid so that blood dripped into Sindri’s eyes. Sindri pulled out the hammer, Mjollnir, perfect in every way except that its handle was short. Loki removed the six gifts and headed back to Asgard where he gave the replacement of Sif’s hair and the hammer, Mjollnir, to Thor; the ring, Draupnir, and the spear, Gungnir, to Odin; and the boar, Gullinburst, and the ship, Skidbladnir, to Freyr. While this tale explains the origin of tools and gifts in the possession of the gods, I think the real lesson concerns Loki, the sometimes charming and sometimes devious trickster. The trickster is an archetype in many early cultures. The spider, Anansi, in the Caribbean and West Africa, the coyote spirit and Kokopelli in Native American and First Nations traditions, leprechauns in Irish culture; the list goes on. As frustrating as it is to decide whether to like or dislike Loki and other trickster beings, I appreciate the lessons they provide, that the world and all the people in it cannot be divided neatly into the good and the bad. There is a little of both in all of us. The tales remind me of an interview I watched with Dustin Hoffman in which he described how he felt about playing villains. To paraphrase, he said no one, even a villain, thinks of themselves as a bad person. So playing a villain just means playing a person who thinks he is a good person but who got caught doing something bad. I’m sure Loki would agree. What happened to Draupnir? Odin placed it on the funeral pyre for his son, Baldur–one treasure to accompany another. Reference to Draupnir can be found in the Poetic Eddas, stanzas 21 and 22 of Skrinismol, The Ballad of Skirnir. Simek, Rudolf. 1993. Dictionary of Northern Mythology. Translated by Angela Hall. p. 65. Snorri Sturluson. The Prose Edda. Skáldskaparmál 43. Baldur (pronounced “BALD-er;” Old Norse Baldr, Old English and Old High German Balder) is one of the Aesir gods. He’s the son of Odin and Frigg [Freya], the husband of the obscure goddess Nanna, and the father of the god Forseti. He’s loved by all the gods, goddesses, and beings of a more physical nature. So handsome, gracious, and cheerful is he that he actually gives off light. Everyone loved Baldur. In a myth, that’s a clear sign that something bad is going to happen. Son of Odin, half-brother of Thor, it’s little wonder that Baldur’s mother (not Thor’s) loved him best. She took every step she could think of to protect him, just as Achilles’s mother Thetis, who dipped her son into the River Styx, believing it would protect him. But she held onto Achilles by his heel, leaving this small portion of his body unprotected. And you know what happened to him. Baldur’s mother Freya took a different approach to protecting him when he began dreaming of his death. She went to every thing in the world and asked them to promise not to harm her son. And they all promised. Whew! When Freya reassured the gods–they all loved Baldur, remember–that she had extracted an oath from every thing in the world not to harm Baldur, they entertained themselves by throwing things at Baldur and watching them bounce off him. What a way to show how much you love the guy. But it’s clear Freya solved the problem, right? Well, not if there is a trickster in the midst. And Loki, the trickster, can be so charming when he wants to be. He pulled Freya to one side, probably implying he was only trying to help, and asked her if there was any chance she had overlooked something. That guy. So charming. Freya admitted she hadn’t asked the mistletoe to protect her son, but what harm could mistletoe do? Loki set out immediately to carve a spear from mistletoe. But he couldn’t take action himself because that would give him away to Freya. Instead, he gave the spear to the blind god Hodr, and convinced him to throw the spear at Baldur. Just like the other gods had been doing with other items. Hodr threw the spear, it pierced Baldur, and Baldur died. Sounds like the story of Oedipus, doesn’t it? Baldur dreams he will die soon. Just like Oedipus receives a prediction that he will kill his father and marry his mother and thereby bring catastrophe to his people. What’s a fellow supposed to do? Oedipus leaves town. But what he doesn’t know is that the man he thinks is his father and the woman he considers his mother aren’t really his parents. 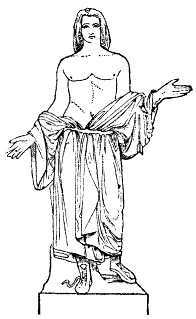 His real father, King Laius, had similarly received a prophesy that his son would murder him, so he had abandoned Oedipus on the side of the road, expecting him to die. But he didn’t. A shepherd found the baby and brought him to King Polybus and Queen Merope who raised him as their own. When Oedipus leaves to avoid the prophesy, he heads for Thebes. He encounters a man on the road, quarrels with him, and kills him. That man is, of course, his real father, King Laius. When he arrives in Thebes, he discovers the king is dead, and the city is at the mercy of the Sphinx. When Oedipus answers the Sphinx’s riddle (What is the creature that walks on four legs in the morning, two legs at noon and three in the evening?) he becomes king and marries the previous king’s widow, his mother Queen Jocasta. What can we learn from all these tales of prophesies and precautions against them? I don’t like the fatalism of these stories, the sense that the future is pre-ordained, and nothing I can do will prevent it. Just another reason not to waste any time or money on fortune-tellers. After giving it more thought, I decided the message in all of these tales is that it doesn’t matter whether you are a ruler or even a god, life throws curveballs that may interrupt the plans you have carefully made. Get over it. What’s important is how to react to the negatives. No one can guarantee nothing bad will ever happen. It isn’t necessarily fatalism. It’s just life. If Thetis and Freya and King Laius and Oedipus had simply lived the best life possible instead of trying to take steps to foil the future, life might have turned out better. 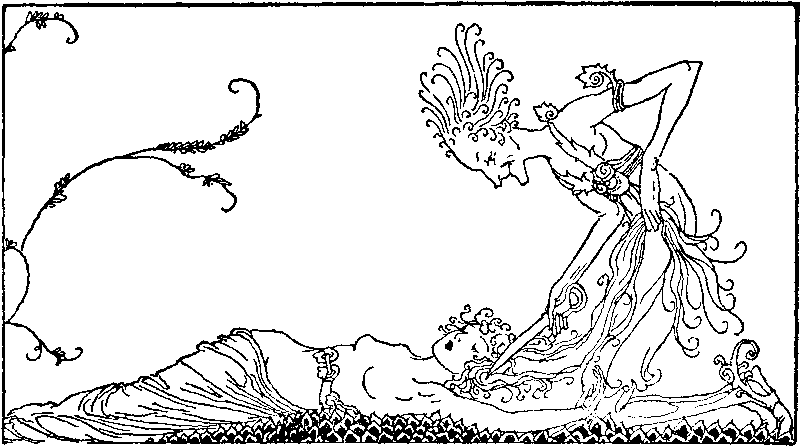 For more information about Baldr’s death, see The Poetic Edda, the entire poem, Baldr’s Draumar, Baldr’s Dream. Snorri Sturluson. The Prose Edda. Gylfaginning 22.